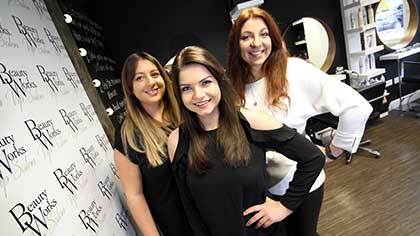 A hair dressing team which specialises in extensions continues to grow after adding a new member to its team. Globetrotting Chloe Ladbury has joined Lox of Love on Aycliffe Business Park after a 10-month tour around the world. The 25-year-old had spent 10 months working as a stylist on a cruise ship after leaving her role with The Works at Cobblers Hall in Newton Aycliffe. It boosts Lox of Love’s team to five as the firm continues to enjoy year-on-year growth. “I’m really excited to be back home and enjoying a new challenge,” said former Woodham Academy student Chloe, who lives in the town. “It’s always been a huge passion of mine. I started training to be a hair dresser when I was 15 and after working on the town for a few years I wanted to get some different experience under my belt. “The opportunity came up to join a cruise, and during 10 months we went all over the world and visited some wonderful places including Brazil, Colombia, the Caribbean and Alaska. Lox of Love managing director Victoria Cartwright says her firm has gone from strength-to-strength, despite being hit by a personal tragedy in 2016. In September last year, Victoria’s sister Anna Swabey lost her 20-month battle with a brain tumour – since passing, Anna’s fundraising efforts have smashed the £100,000 barrier. “It was a very difficult time,” says Victoria, who runs Lox of Love with her mum and business partner Linda. “But luckily our staff and clients were extremely supportive and understanding. Victoria now hopes to grow her team at Lox of Love’s premises at Unit 6 within Evans Business Centre on Durham Way South. Chloe joined the team as part-time Saturday assistant Amber Peake also made her role full-time at the family firm. “We’re delighted with the addition of both Chloe and Amber,” adds Victoria. “The hair dressing and hair extensions side of the business has just expanded so much, and we were struggling to cope with demand at one point. “Chloe was already trained in extensions and I knew how good she was from when she was previously employed in Aycliffe. “Amber used to be our Saturday girl while at school but has become very popular with our clients and is coming on in leaps and bounds. She continues to offer a hair and make-up service while continuing her hair dressing training, and she will eventually become fully-trained in hair extensions. Lox of Love, which is official stockists of Beauty Works extensions, will soon be offering a new wig-fitting service for clients with medical conditions. “So I feel like the support in this region is lacking a little bit, so within the next month we’ll be offering a full wig-fitting service, not just to chemotherapy patients, but other people with medical hair loss. Mum-of-three Victoria, a fully-qualified hair dresser, launched Lox of Love in December 2012, originally as a mobile service which eventually amassed around 500 clients, before opening her own premises on Aycliffe Business Park in May 2014.